Bosc Pear. I found it while I was doing my groceries shopping at Cold Storage. Bought it simply because of its beautiful russeted skin. 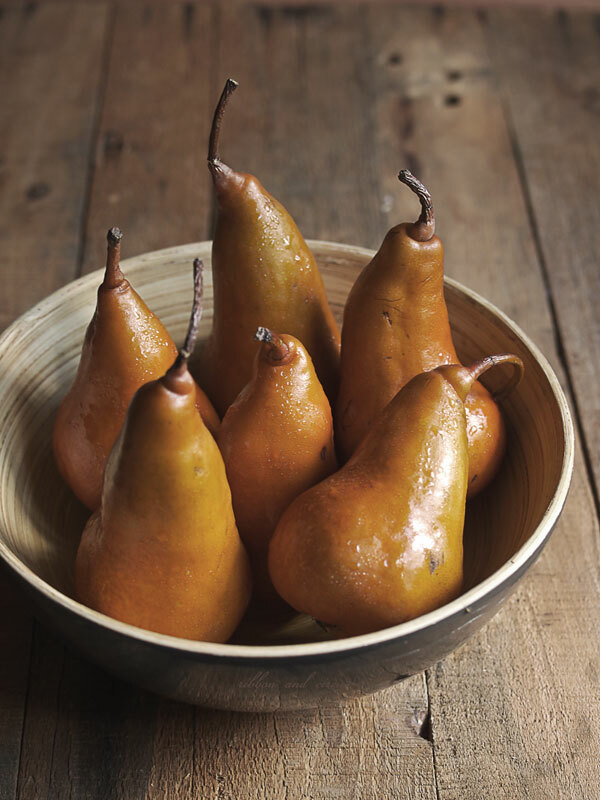 According to Saveur.com, these pears are a favorite for poaching and baking because of its firmer texture which can retain their shape when cooked. It has a bold sweet aromatic flavor and quite a pleasure to eat. Anyway, it didn't take me long to figure out what should I do with these pears :). 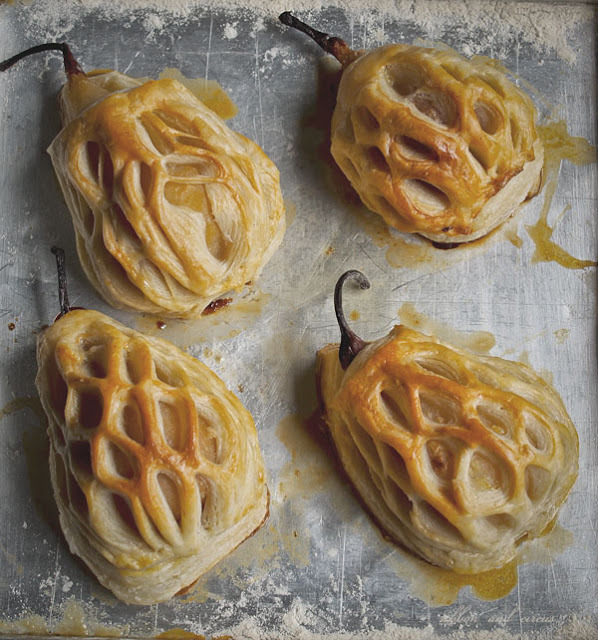 I poached four pears and wrapped it with pastry while kept the other two pears for Adam's Fruity Friday class. He loves this pear more than the Forelle type. This is how I wrapped the pears. I wish I could do time-lapse, but I haven't got much time to explore it yet. For a while, please bare with the gif image first :P The lattice pattern can be found in this entry. My previous post on the same recipe can be found here and here. 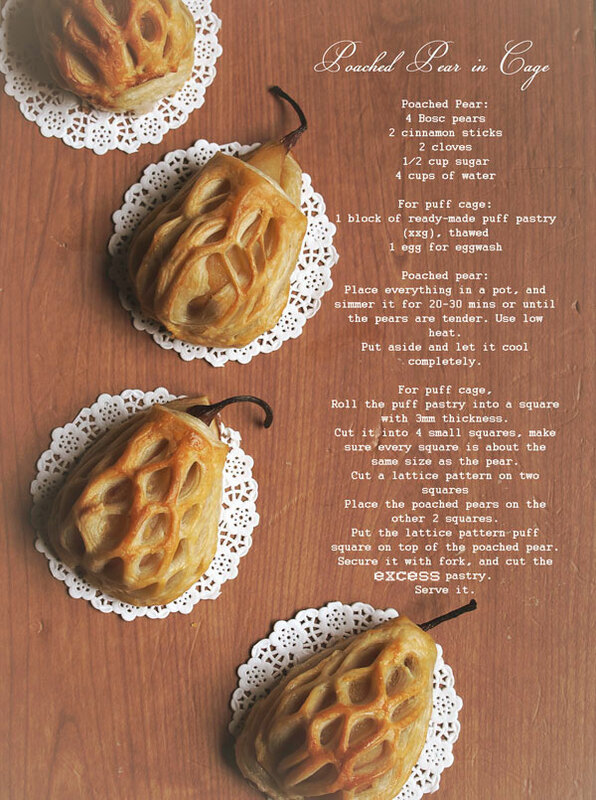 Beautiful pictures and very tempting poached pears! I'm not sure how you do it but I love how you make food look so beautiful without a bunch of props. The lighting on those pears are awe-inspiring! Mmmmmm, Bosc pears. I call them The Ugly Pears. They are the best - firm and crunchy like an apple, but with a strong sweet pear flavour. AND they're always cheap - probably b/c people don't like the way they look! Really like the idea ! It looks scrumptious. Should try to make this soon. Love the technique with the pastry! I definitely have my t-try-wishes set on this one for the next weekend! This is really beautiful. I'm going to show my MIL this post of yours. The other day she made sth like this but she chopped the pears and put it on a dish with a latticed pastry cover (macam apple pie). As for the lighting, I'm using natural light from my kitchen window. I did a little post processing job though. Toche2 he he Happy Mother's Day to you too.. so what did you do on MD? Adam pun susah nak makan fruits lately. Picky pulak. some fruits he used to love, i.e. grapes dah tak makan dah.. We have to push slowly lah kot.. he he I slalu buat muffin letak fruits inside he he ..so at least dia makan secara x langsung.. Thank you for your highlight. I never came across with these pears before. It's not that cheap here because it's imported from US. I bought it simple because of its unique character. :) Thanks again. I just saw these pears on RecipeNewZ. They are GORGEOUS! How beautiful and elegant :-). I love the "video", makes me feel like even I can make this. Brilliant post! Those look fabulous! I can just imagine the gasp of delight as guests see this coming on the table before them. Beautiful. Brilliant is an understatement! I'll be celebrating my new place (that will have an oven!) with these shortly. I love the stop-motion instructions. Wow, these look so impressive and different! 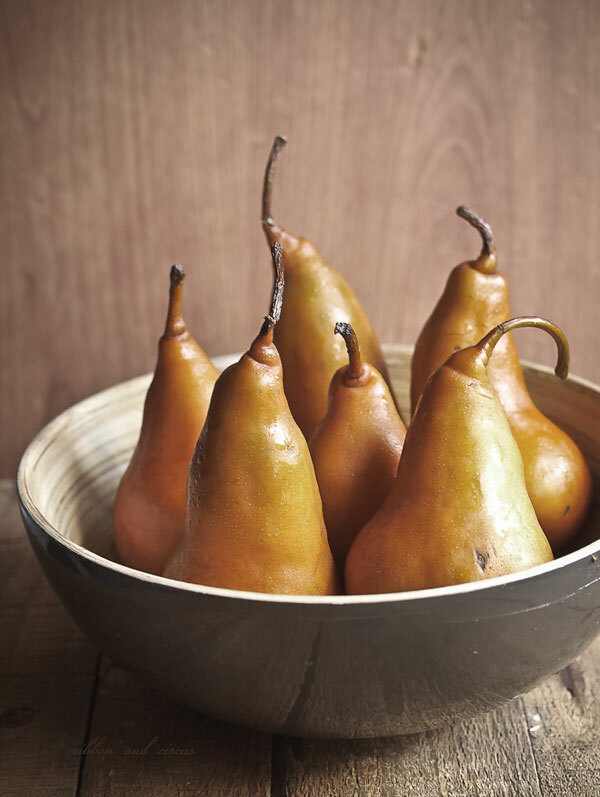 They also sound so wonderfully delicious – I adore poached pears. Me too- Nothing can go wrong with poached pear. I can't tell by the photo, but I presume you peeled the pear. I couldn't find the baking instructions either.